The Panasonic ES2113PC Review | Is it Worth It? Seeing my wife struggle with her makeup getting caked up everyday got me thinking. Not that I am an expert at women’s grooming, I am a men’s barber after all, but I thought there must be a better way to do that. So, with a little digging I discovered that to make sure your makeup is applied evenly, you need a women’s facial hair trimmer. Women usually have peach fuzz that is hard to see but can lead to that makeup application going awry. Which brings me to the Panasonic ES2113PC. After doing some research I discovered that she should be trimming her eyebrows and facial hair with this Panasonic trimmer for women. The Panasonic ES2113PC trimmer has a lot of features that makes it indispensable as a personal groomer for women that goes above and beyond a simple women’s eyebrow trimmer. Let’s dive deeper in this review of the Panasonic ES2113PC and see the many ways it is simply the best women’s facial trimmer and eyebrow shaper. If you want to see how the Panasonic ES2113PC stacks up against other eyebrow shavers, then check out our guide to the best eyebrow trimmers. 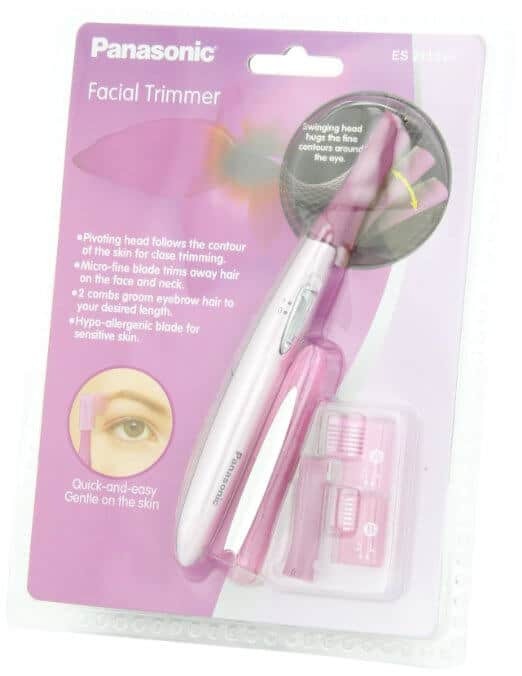 There are a lot of features to like about this ladies personal trimmer. Made from stainless steel and coated with a hypoallergenic coating, the Panasonic ES2113PC won’t cause any blemishes or irritation on your skin. And with an ultra thin blade, you can really exfoliate if you use it as a dermaplaner. It can catch all of the fine peach fuzz hair easily and on any skin type. Thick, coarse hair is also no match. Although the Panasonic ES2113PC trimmer blade is very sharp, it has a guide on it to make sure it won’t cut you. And it is rounded to allow it to glide across your skin. If you have sensitive skin, then this facial hair trimmer is definitely made with you in mind. There is a second, smaller blade for when you want to trim your eyebrows. Since faces are not flat surfaces a very nice features is the pivoting head. Getting the right angle with any eyebrow trimmer or facial trimmer is important. One, to get the best results as you want to the Panasonic ES2113PC trimmer razor to be at less than a 45° angle to effectively exfoliate the skin. And, two, to make sure you don’t mess up your eyebrows when you are trying to shape or arch them. With a flex of about 10° to either the left or right, you can be sure that even going along the contours of your face, the angle is correct. Getting around the chin, or jaw, can be tricky unless you’re ambidextrous. This pivoting action takes all the effort out of the equation. To really trim your eyebrows, the Panasonic ES2113PC trimmer comes equipped with two plastic comb guards. One will leave the eyebrow hair trimmed down to 6mm to 8mm depending on how you set it and then a shorter one that leaves the eyebrow hair at 2mm to 4mm. They simply glide onto the blade head when you have the eyebrow trimming blade on. Before you get started you need to throw in a battery. Unfortunately it doesn’t come with one, so hopefully you have a AA battery already and can get started as soon as you unbox it. Once you have the battery in it is ready to go. To shave your face and get rid of the peach fuzz and fine hair, you need to use the longer blade head. To put it on, there is a button at the base of the head attachment that you pull down with one hand. With the other hand, you need to kind of bend the plastic and the blade holder will pop open. Then just put the long Panasonic facial trimmer blade in there. You don’t need to use any oil or moisturizer on your skin to get it lubricated first. The Panasonic trimmer blade is sharp enough to glide over the skin. If your hair is coarse and you can see what direction it grows, then angle the Panasonic facial trimmer at about 45° and start going against the direction of the hair. Against the grain, so to speak. For harder to see peach fuzz, if you can’t tell what direction the hair is growing, then just work methodically with the Panasonic facial trimmer and that should be fine. When you are done shaving the face, then you may want to put on some moisturizer. Not because your face will be irritated, but because now that your skin has been exfoliated, it will give a boost to the cream to really penetrate into the layers and leave your face looking vibrant. First make sure the short blade for eyebrows is attached. If you need to attach it follow the instructions in the last section. Next, you want to make sure you know how short you want your brows. With the Panasonic trimmer you have basically 4 different lengths for options. There are two eyebrow trimmer comb attachments, each with two different lengths available. Slide the comb with the length onto the shaft of the blade and make sure the S for short or L for long lines up with the arrow and that will be the length according to the comb. For example, wif you want to leave the eyebrows 4mm in length, use the smaller of the two combs. When you insert it over the Panasonic trimmer blade, make sure the L lines up with the arrow. Since this comb can cut to either 2mm or 4mm, then obviously the L marker will be 4mm. Now, just glide the trimmer over your eyebrows going against the direction of growth. You may need to go over them twice to make sure all the hairs are the same length. To shape your eyebrows, take the comb off and use the exposed blade to shave away the edges where the hair is thin and the tweezers don’t work. To really shape them and give them an arch you may want to try using an eyebrow shaver like the ones I reviewed here. Q: How long do the Panasonic trimmer blades last? A: It is tough to nail down a precise timeline as it depends on a number of things. If your skin is rough and your hair is coarse, then that will dull the blades faster than if you have mostly peach fuzz that you’re trimming. Also, if you use the cover that it comes with to store it. If it is in a humid area, that will also cause the blade to get dull faster. Q: Is there any maintenance to do with the Panasonic trimmer? A: Yes and no. Of course, you can do nothing special aside from wipe the cut hairs off of it with an old toothbrush, for example, and that would be fine. But, to keep this going for a while, it helps to pop open the blade chamber and get all the hairs that have gotten inside. Just wipe them out and that will keep the blade sharp and fast. Q: Can I use the Panasonic trimmer if I have acne? A: You should try to get rid of the blemishes before you use the facial hair trimmer if you want to prevent spreading your acne and making it worse. 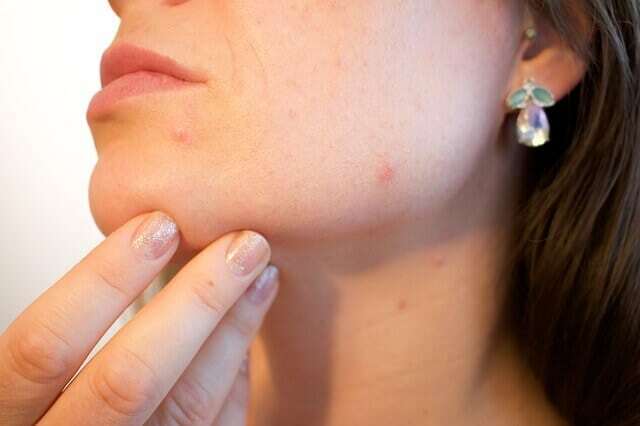 If you have a pimple or two, you should be fine, but make sure you use some Witch Hazel or something similar to clean your face and the Panasonic trimmer blade after each use. Now that my wife is doing dermaplaning, she has noticed a big improvement in her complexion and her makeup goes on so much more evenly, and as a result quicker. Her eyebrows are on fleek and it’s thanks to the research I did to find out about the Panasonic facial hair trimmers. If you have any questions about the Panasonic ES2113PC trimmer, dermaplaning or women’s eyebrow trimming in general, then drop a line in the comment box below! We love hearing from you and will get get back to you ASAP!